Buy the Farm . . . Share: Have a ‘Gansett! I got a few delightful items tonight for another meal ready in 20 minutes. Take that Rachael Ray! I got these tasty little guys for a song -- a song called $3.99 a pound! Boo ya! 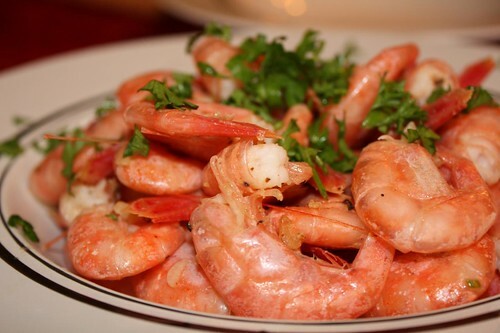 They're pink shrimp from the Gulf of Maine. I cooked them up with olive oil, garlic, salt, pepper, a squeeze of lemon, and a little parsley for garnish. The best $2.95 I've ever spent on a food item in my life. They're only in season for a few weeks a year so I had to make hay while the sun was shining. Shrimp hay! Yoink! 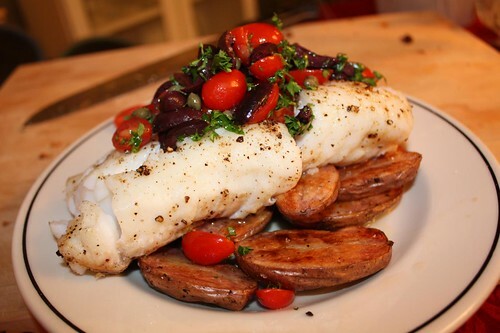 For the main course: I roasted a cod loin along with some organic red thumb potatoes from Kent, Connecticut. They were tasty. The outside resembles a red thumb. Go figure! The inside resembles the interior of a purple and white-speckled alien thumb. That I was not expecting. I also quickly threw together a relish with grape tomatoes, kalamata olives, capers, parsley, olive oil, and cracked pepper. 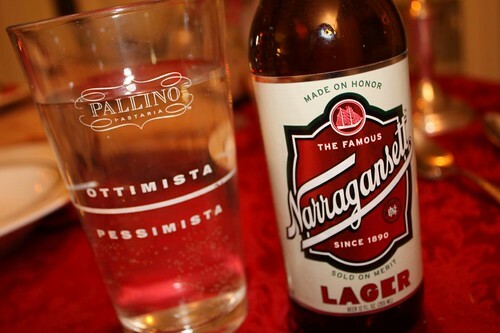 Narragansett is something my father would occasionally have around in tall silver (or was it gold?) cans in the fridge that was in the garage. My father-in-law romanticized this beer which was advertised on the Red Sox games he was miraculously able to pick up on the radio while in Canada as a youth. As the latter of the two fathers once put it: it's best served as cold as possible. My estimation is that 33 degrees is the warmest this beer should be allowed to reach before being consumed. The beer is pictured here with a glass of water. In a blind taste test you would stand a 50% chance of guess which one was which. It's a beer from my home state, and for that I am grateful. Rhode Island has not exactly exploded onto the scene with many alternatives in the past 120 years. It may not match your hoity-toity-hoppy-unfiltered-microbrews in the New England area but 'Gansett's got it where it counts. It's made on honor and sold on merit. It says it right on the bottle! It's so funny. I was reading this while watching Rachael Ray! Spooky. We can't watch Rachael Ray here. They got rid of the Food Network because they couldn't come to an agreement with our cable provider. Go figure! Curt Gowdy, Ned Martin and Mel Parnell. As I remember, it does not get much better than that. Mel was not a very good braodcaster, but he is still the last left handed Red sox picher to win 20 games.